A powerful detoxifier, especially of the liver and blood. It helps to neutralize toxins and environmental pollutants in the body. 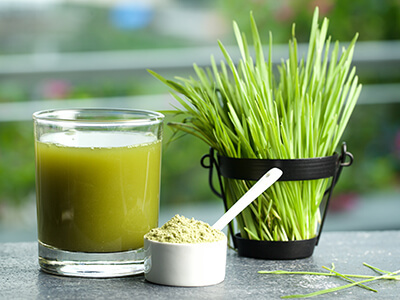 Wheatgrass powder is prepared from the cotyledons of the wheat plant. It is a source of dietary fibre, chlorophyll, amino acids, several minerals, vitamins, and enzymes. 1. 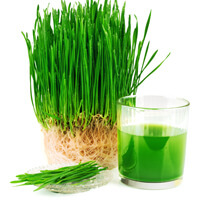 Wheatgrass is a complete food source. It has just about all the nutrients necessary for your body. 2.Enhance Digestion : Wheatgrass has been documented to be very helpful with a smooth digestion process. This is because the plant is known to cleanse the colon and restore acidity to healthy levels. There is a certain balance between various bacteria groups in a healthy digestion system and if they become off balance, they put body in a state,susceptible to disease and health problems. 3.Red Blood Cells and White Corpuscles : Wheatgrass boosts the formation of red blood cells and white corpuscles. 4.PH Balance : As an alkaline food supplement it balances body’s PH, restoring favorable alkalinity. 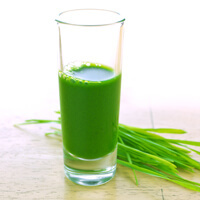 5.Enhance Digestion : Wheatgrass has been documented to be very helpful with a smooth digestion process. This is because the plant is known to cleanse the colon and restore acidity to healthy levels. 6.Lowers Blood Pressure : It also dilates the blood pathways and reduces blood pressure. 7.Cleansing & Detoxification of Liver & Colon : Wheatgrass powder detoxifies liver, cleanses colon and removes toxins from your body. 8.Relief from Pain and Inflammation : By lowering and helping eliminate general inflammation, this amazing supplement causes significant relief from common body aches and painsrestoring the natural body’s ability to thrive and stay healthy. 10.Stimulation of Thyroid Glands and Metabolism : Wheatgrass stimulates the thyroid glands, therefore speeds up the metabolism. This helps overcome obesity, indigestion, and other problems relating to slow metabolisms.